*Believe me, it's cheaper to pickle him than to smoke him!! *GULP GULP GULP GULP GULP GULP.... this is 10 x better than salt water!! *Learning to think like a fish can be taken alittle too far! *Recon Jimmy will kiss me on the lips? Maybe after a breath mint!!! *I don't have a drinking problem. Really it's the fish. He's the one with a drinking problem. *I swear officer its the fish drinking it, not me! *I'm only after the worm! *A whole new meaning to the term "Fish Lips!" *Why does everyone keep saying I drink like a fish? *Talk about a fish-eyed fool!! *Talk about a fish out of water! *I can drink underwater too! *If I get pulled over for driving, I bet it want be because of drinking. *He takes after his father. *Freddie, please don't drink, you know how enticing those hooks look when you've had too much. *He is a disgrace to the old "school". *Really guys, you just tape the gills shut and it all goes right to the tummy and directly into the blood-"stream". *This is your brain on Alcohol. *A cat's dream come true! *I am definitely allergic to cats! *This isn't liquor it's marinade. *He'll really be Wal-eyed after he finishes that bottle. *Why am I drinking? Well Lets just say Betty caught me upstream with a fresh little salmon. *I don't know why I drink, I always feel Crappie in the morning. *I hope I don't make a real bass out of myself. *I'm not as fishy as you drunk I am. *Aqua man really is a drunk. *It started as just a little nip for the neap tide but he'll feel green around the gills in the morning! *Just don't get that thing stuck!! *Now that's what I call a "FISH EYED FOOL!" *I guess fish really do get thirsty! *That Bob; He drinks like a fish! *Uncle Bob is really making a bass of himself! *I swear officer, he just snapped at me! It wasn't my fault! *hey, this is good. wait, my head. this isn't beer. FRED!!! *One way to hide your drinking problem and pickle your fish at the same time. *What a wonderful suprise its a croosbreed! *Since when do fish have arms and legs??? *I thought fish only drank water but this is rediculous! *Tequila & Methamphetamines - they just don't mix. *This is what fish would do if they had a body. *I told my Mother all that Cod Liver Oil would do more than make me regular. *He'll be green around the gills tomorrow! *The cops will never find him in that out fit. *Aw.. my frickin head, I'm so wasted. *See, you only think you see a fish head, I told you, you were drunker than me. *I think my mama was drunk when she met my dad. *You have to look like a fish to drink like a fish! *You get'em dressed walleye call the doctor. 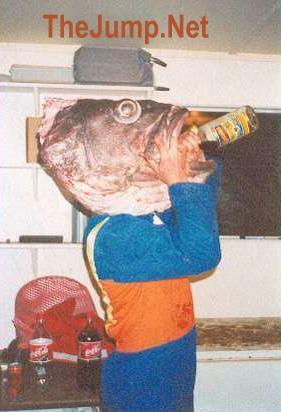 *Poster Child for "don't drink"
*Since there was no lampshades on the boat, Al tries a giant fish head for his gag. *My father is the man from Atlantis. *IF HE COMES TO DINNER HE BETTER TASTE GOOD!!! *Now you know why they have to breath through the gills. *Fish heads, fish heads, rolly polly fish heads. Fish heads, fish heads eat them up yum!!! *Now show me your fish face. Lets see who's better. *The real mascot for UVA. *For my drinking problem, I attend the Catch and Release program. *Finally caught him a largemouth. *Hey, that guy with the fish on his head...What's up with that jumpsuit he's wearing? *Bob's the reason we started having our parties in the garage. *This is a rough way to get my Omega 3 fish vitamins! *I always knew Bob could drink like a Fish! *I'm not a grouper.....I'm a gulper! *I told you he could drink like a fish!! *OH, for once Harry, get your head out of your bass!!!! *Do you think the Botox needs a little tweekin doctor? *I wish I never had that plastic surgery. *They say that fish is brain food, cant understand why??? *So this is what fisherman do when there not fishing! *Tim now hold on a sec I think I can get a fish OOOOOOOooooh Tim you ok?? ?